The children had a very successful enterprise sale raising over £400. We are going to be sending some chickens, goats, fruit tress and perfect plots of land to the value of £150 to “Send a Cow”. The afternoon group had a very successful sponsored obstacle course raising over £200. The Nursery assembly was based on our mini beast topic with songs and acting out the story of The Hungry Caterpillar. All the children performed really well especially the caterpillar. As part of the project we sent away for caterpillars which have now nearly all hatched. The children have shown a great interest in the progress and look forward to releasing the butterflies in the Nursery garden this week. We had two very enjoyable Teddy Bears’ Picnics in the park. The children had a great time at the park and the weather was very good. Everybody participated in the sports even the Mums. The pre school children are having their enterprise sale in the Nursery on Tuesday 25th May at 11.00a.m. Nursery parents will be able to purchase their own child’s work. We have been busy making cards, painting flowers which have now been framed and we are having Jo from the bead shop on the 19th to make necklaces with the older children. A variety of other items will also be on sale that day. The younger children will be doing a sponsored obstacle course that afternoon in the school hall at 2.15.p.m. to which all parents are invited. We will be sending a contribution to an African charity. 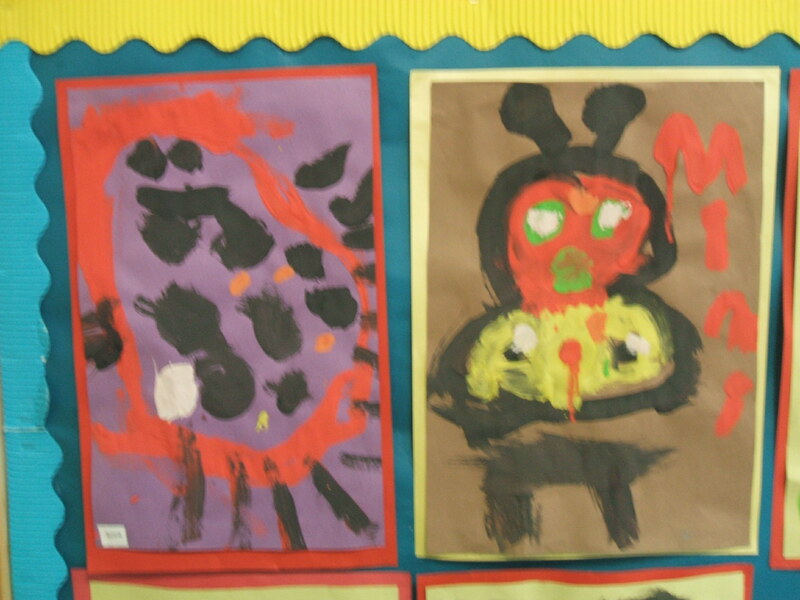 Here is some of the children’s art work on mini beasts.